The Zephyr V4 brings fresh new colours and printing to the very popular 2015 design. New ultra-strong lightweight bladders have been incorporated into the Zephyr V4, reducing weight and improving light wind performance even further with lighter steering and faster turns. Incorporating elements of the performance dominating Edge V8 along with the ease of previous model Zephyrs to fly and relaunch, the Zephyr V4 has a crisp powerful feeling and a direct positive bar feel, with instant power delivery and superior up-wind performance. It has a very large wind range, which means if the wind picks up you can comfortably stay out on the water. These attributes make it perfect for cruising, jumping, honing your strapless airs or learning handle passes. The boost is impressive and floaty, with smooth and easy kite loops. There is no question that the Zephyr V4 will get you out there enjoying whatever aspect of kiting you prefer on the day. If you are looking for an all-round one-kite quiver and often ride in light winds, the Zephyr V4 is the kite for you. As with all Ozone products, we pride ourselves with top of the line manufacturing in our own factory using the highest quality materials. 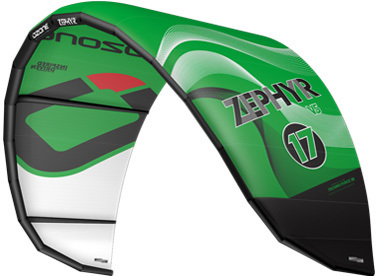 The Zephyr V4 is constructed with quality proven Teijin D2 canopy material and Teijin Dacron providing a crisp feel and a strong kite.